Three men, three great men, have filled my thoughts, almost constantly over the last decade. Two are great artists – Gerard Sekoto the father of Black South African art, and Norman Lloyd, a great Australian impressionist. And the third is my uncle. Harry Noel Greenberg, my father’s brother. An aviator who lost his life at the age of 28, in April 1945, when his military aircraft crashed near Marseilles. What have these three men got in common? Well, certainly France shaped all of their lives, starting within a year or two of each other. Gerard Sekoto , a self imposed exile left South Africa in 1947 never to return. Norman Lloyd sailed out of the the Sydney Harbour heads in 1930, first to London, and in 1945 to France. And Harry Greenberg lies in a marked military grave in the Marzargues War Cemetery, Marseille, his date of death, 19th April 1945. So, with all, their life’s journeys, their ‘exiles’, did not begin in France, they ended in France. But there is a lot more, which partly explains my preoccupation with them all. The willing dislocation of the migrant’s journey unifies as a theme. Sekoto is revolted at the ignominy and injustice of apartheid South Africa. And leaves for France, a strange land, a new language, a year before the National Party takes power and brutally enforces apartheid. Lloyd leaves a more sedate and settled life in Australia for London, then France. Why? And Harry Greenberg, Tanny, is not obliged to conscript. As a fifth year medical student, South Africa needs doctors. He chooses to conscript, and and commits to serve, despite not requiring too. And cruelly only nineteen days before the end of WW2, on a non-combat flight, flying from Algiers to Vitrolles, is misdirected in mist and flies his DC 3 Skytrain into a mountain above Vitrolles. Of course to fully understand their journey’s I must go to France and retrace their steps. I have never been to France before. I will start in Paris, and visit Sekoto’s parisienne locales. Then I will drive south to Chasignolles, where Norman Lloyd painted his volume of work and lived a bohemian life with his French lover, Zenaide . And I will end my trip at the coast at the grave of Harry Greenberg, in the war cemetery in Marseilles. I hope to find out a bit more about these great men. I hope to find out a bit more about me. Thanks for coming with me. I was born in the Western Cape, South Africa in January 1960. My first recollection I have of an adult in my world, was Eileen, the ‘maid’, who my mother always told me, loved me fiercely. I remember, yes a vague and distant Kodak slide, being strapped to her back by a Xhosa blanket whilst Eileen performed her house duties. I remember feeling safe and contained. I don’t remember when she left. That is the problem. Has always been. The leaving is unexplained and unprocessed. It is not a leaving, it is a vanishing. Has always been. There has been a lot written, for a long time about the hurt caused by an apartheid South Africa. Intensely personal, often brutal narratives. I can’t find the language to write that, even though I want too. But I believe my journey into the world of Sekoto will allow me to understand a bit more about myself, South Africa, the times. As you might have guessed, I have also left my country of birth, south Africa, and now live in Sydney Australia. So I suppose I am channelling Gerard Sekoto in some way. And in all of this, I wonder often, if Eileen ever left to make a fresh start somewhere, fresh, somewhere new. I like to think she did, but somehow I don’t think so. Gerard Sekoto, an acclaimed South African artist left South Africa for Paris in 1945. And never returned. Never. What was behind this this decision and his resistance to return. I want to wrap pre-existing and new research around his decision. And boldly, I want to interpret his psyche. I want to understand his vanishing. I wonder as I write if I can feel his pain, his joy, his wonder and his sadness. Dare I claim my migrant narrative gives me special insights? A crucial part of the discovery will be the lives of those close to him. Ernest Mancoba, another self exiled South African and a founder of the CoBra Art Movement. Marthe Baillon, his lover and muse, and others. I am going beyond the facts of Sekoto, much has been written about his chronology. That can provide a framework for the narrative, but I want to go beyond the facts. Understanding an interpreting their journey of exile, trying to bring the journey back to life. Back to life, beyond the facts. Dare we try and walk their journeys of emancipation or do we slowly and metaphorically meld into the alleys of Paris and disappear? As I said, I have never been to France. It is time. Discovering Gerard Sekoto will help me discover two people. One of course is me, and the other is Eileen. But when I get the memory flickers of myself strapped safely to her back, as I often do, over my fifty plus years, Eileen and I feel like one. A quiet African man appeared at the ticket office at the entrance of the Johannesburg Public Art Gallery. The year was 1940. South Africa was at war with Germany, fighting alongside the allies in all the major battle theatres. “One ticket please” was the request from the man to the attendant behind the counter. A simple request. The woman behind the counter frowned. An awkward silence. She gestured, without words, to the small sign at the entrance. “ Slegs Blankes/Whites Only” , and shook her head. She looked down. A small moment, but the pain of it was patent. A standoff. “ I am Gerard Sekoto, and I have a painting hanging in your gallery. I just want to look at it hanging. I won’t be long. Just ten minutes. Please.” Indeed this was a seminal moment not only for Sekoto, but the art movement in South Africa. In a most unexpected move, in early 1940, the Johannesburg Art Gallery had indeed purchased one of his pictures and this was to be the first picture painted by a black artist to enter a museum collection. “He held her gaze as she looked up, but she was not in a position to accede to his request. The law was the law. About an hour later, a quiet African man returned to the same counter. He had on workers overalls, and held a tin bucket in one hand, and a white mop in the other. The attendant looked up. No words would pass. She simply flicked her head towards the gallery entrance, and allowed the man in. Gerard Sekoto, South Africa’s father of African art was now a humble cleaner, with a bucket and a mop as his brush and easel, moved surely but surprisingly slowly through the gallery. Taking in the great works, many colonial British works, large paintings, big gold frames, the powerful and dramatic symbols of the colonizer. He did not stop though, until he rounded a corner and saw his painting. He stood before it. The mop his staff, the bucket his shield. He smiled. For five minutes he stood in front of it, fearful that an official might move him on, or discover his disguise. So he moved quickly back towards the entrance from whence he had come, and acknowledged the ticket office attendant with a faint smile and mouthed a thank you. Cry the beloved country. The die had been cast. He would leave South Africa soon, and deep down, he knew that he would never return. 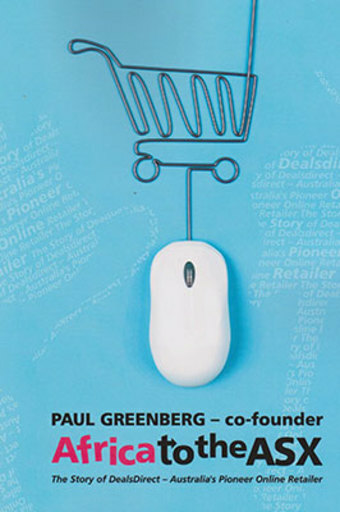 Paul Greenberg is a pioneer of Online Retail in Australia. Affectionately dubbed the " Grandfather" of online retail in Australia, his rollicking tale of entrepreneurship recounts a wild ride from Africa, to his company listing on the Australian Stock Exchange. Told with humour and a gritty truth, his story is proof that small failures are the stepping stones to success.